Lancaster Eurodance is a friendly music and dance group, specialising in the folk dances of Europe. We meet at The Gregson Centre, Moor Lane, Lancaster, usually on the first Tuesday evening of the month at 8.00pm. The session is an informal mix of dance teaching and live music, we usually start by teaching a few dances, beginners are always welcome and you don't need to bring a partner. We do a lot of French folk dances, including those from Brittany, and we will often do dances from Scandinavia, the Balkans and elsewhere. After a while the formal teaching ends and we'll dance to whatever the musicians feel like playing (or can be persuaded to play!). We make a small charge to cover the cost of the hall, £3 per session or £20 per year (the year runs from September-June). We don't usually meet during July and August because so many people are away. 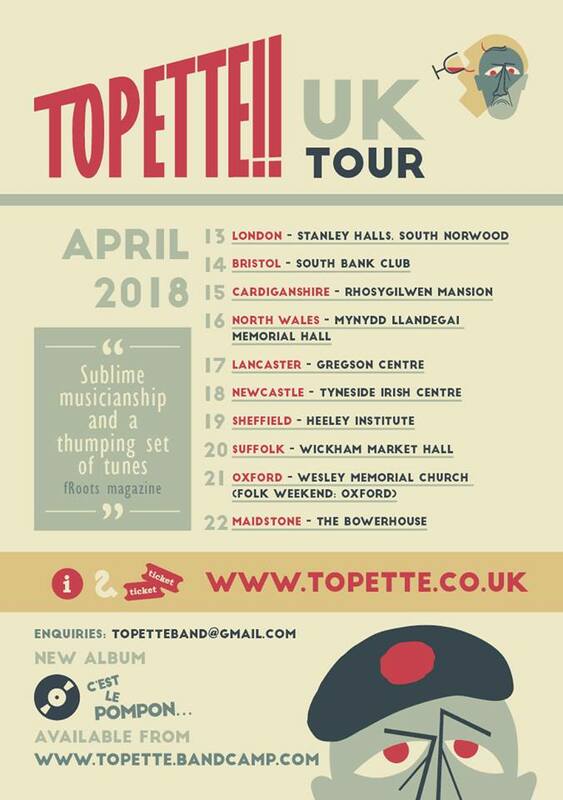 April 17 Bal/concert with Topette. There will be music workshops for accordion (mixed chromatic/piano and melodeon) and fiddle from 6.00pm - 7.15pm. During July and August there is no session. "Feet on the Street" is an emerging Eurodance demonstration team to which musicians and dancers are most welcome. See the Feet on the Street page for more information. If you play an instrument, please feel free to bring it along. Many of the tunes are easy to pick up and usually there will be written music to hand. A Lancaster Eurodance tunebook has been developed and copies are usually available at the sessions, but for copyright reasons it is not available on line in its entirety. However a subset of tunes can be downloaded from the Music page.